Universal Tool Impact Wrenches feature a refined design with a twin hammer and biased motors that provide torque. Universal Tool Impact Wrenches are designed with low weight composite housing, an ergonomic trigger design with feather control, and a push button forward/reverse for an instant change in direction. Universal Tool Impact Wrenches also feature a four position power management switch that is conveniently located in back cap, a titanium finish hammer case, built-in side impact buffers, and over-molded ergonomic grips. The UT8065P Universal Tool 3/8'' Pistol Impact Wrench is one of thousands of quality tooling products available from MRO Tools. Please browse Universal Tool 3/8'' Impact Wrenches for tools similar to the UT8065P Universal Tool 3/8'' Pistol Impact Wrench. 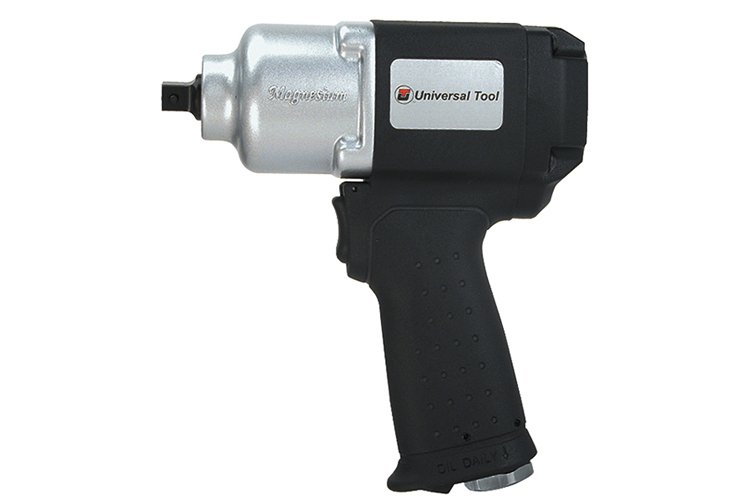 UT8065P Universal Tool 3/8'' Pistol Impact Wrench description summary: Universal Tool 3/8'' Pistol Impact Wrench. Socket Retainer: Spring Pin Square Drive: 3/8'' Loosening Torque: 550ft/lb Max Torque: 500ft/lb Working Torque: 50-450ft/lb Free Speed (RPM): 11000 BPM: 1600 Noise Level (dba): 90.0 Length: 6.1'' Quantity discounts may be available for the UT8065P Universal Tool 3/8'' Pistol Impact Wrench. Please contact MRO Tools for details.